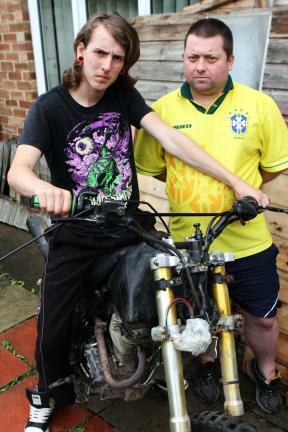 Seventeen year-old Daniel Lovejoy worked through his summer holidays and at the end, he spent £110.00 on an offroad bike. Sadly for Daniel (but perhaps happily for those living near where he used to ride it) his bike was stolen when thieves broke into his father’s garage. The next day, the bike was discovered nearby, having been dumped by the thieves. Hurrah! The Police wouldn’t allow Daniel and his father Keith to retrieve the bike. Instead, they recovered the bike and sent it for forensic examination. Five weeks later, the justice system having apparently exhausted itself in this particular instance, Daniel was informed by letter that he could retrieve the bike if he paid £150. And that if he failed to do so, the charge would rise by £10 a day for every additional day that it was stored beyond the two weeks he was given to retrieve it. It’s funny how long it takes ordinary people to realise that so-called civil servants such as the police, health workers and educationalists etc aren’t actually there to look after us. They aren’t, of course. They are there to serve the objectives of the Government. In my case it happened when, on reporting a break-in, I was told by a police officer that they wouldn’t be sending anybody round to have a look at the scene of the crime because there really wasn’t any chance of catching the culprits. I was disillusioned. Unsurprisingly in this case, Keith Lovejoy was furious. He has written to his local councillor and to his MP but fears by now the bike may have been disposed of. I’m not sure I ought to tell him this for fear that he might explode, but Daniel’s troubles may not be over. Daniel may be charged an additional £50 for the disposal of the bike that was stolen from him. And if that weren’t bad enough, since it’s unlikely that the police would recover at the auction of the bike anything like the storage charges that have been levied, the balance could be recovered from Daniel as a debt. The case hit the local press this week and in a statement responding to Keith’s complaints, a spokesman for the local police force said that the collective hands of Durham Constabulary were tied. It is a national scheme and the fees are set by the Government under the Removal and Disposal of Vehicles Regulations. Actually, it’s The Removal, Storage and Disposal of Vehicles (Prescribed Sums and Charges etc.) Regulations 1989. These regulations apply the fees applicable where the police or a local authority recover a vehicle under The Removal and Disposal of Vehicles Regulations 1986, which is itself brought about by section 99 onwards of The Road Traffic Act 1984. But, you guessed it, it’s not that simple. Which is interesting, because the concept of “abandonment” is a legal thing and it relates to the rightful owner of something effectively surrendering his title to that thing. But wait… Daniel hadn’t abandoned his bike. It had been stolen from him. Therefore, he hadn’t abandoned it. Which means the charges imposed by the Contract Vehicle Recovery Scheme don’t apply. Now consider this. The failure of which ever grey sector quango or contractor holding Dan’s bike to return it to him when demanded amounts to wrongful interference with goods – what we used to call “conversion”. This is a “tort” – a civil wrong that could be the subject of action in the County Court. Dan would be entitled to damages for the failure of the Police or whoever else may have control of his bike to return it to him upon demand. He would doubtless also obtain a court order requiring the bike’s immediate release and, if the bike has been “disposed of”, he would get damages to the value of the bike. This is the sort of thing that legal aid lawyers deal with all the time. And it’s why you should think twice about supporting the Government’s proposals to scrap criminal legal aid and introduce price competitive tendering just because you think you would never be in a position where you’d need a lawyer to protect you and yours. Join the campaign against PCT and the abolition of legal aid. And give Dan his bike back.